Laura Harvey is possibly best known in the UK for her time in charge of Arsenal Ladies, where she guided the club to three consecutive English league titles, one FA Cup and two Continental Cups. 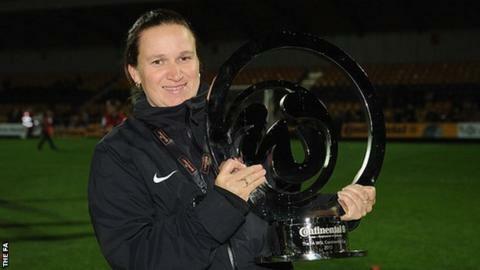 However, after moving to Seattle Reign in 2013, the 35-year-old is a big name in the United States of America too. Harvey was recently named the National Women's Soccer League Coach of the Year for the second consecutive season. And on Thursday, the club take on Kansas City for the NWSL title. She is now one of several English coaches in the league, with Mark Parsons at Washington Spirit and Matt Beard set to join Boston Breakers. So how has the former Birmingham City Ladies player tamed the women's football world in America? After three successful years at Arsenal, Harvey says she moved to the States to pursue a "different challenge". "The biggest difference is how things are managed off the field," she said. "The players are not contracted to your club, they're contracted to the league which means they can be traded. "You can't go and buy them and the team with the most money isn't going to win. "It's about what the coaches can get out of the group of players they have or how can they trade to get the players they want. "On the field the players hadn't spent a lot of time on defending but their attacking understanding was probably on a different level to any players I've ever coached previously. "Mixing the two of them together is one of the reasons we've been successful - the desire of the Americans to win plus the mentality of the Brits to not lose." Settle have a number of international players in their squad, including USA World Cup-winning goalkeeper Hope Solo and attacker Megan Rapinoe. "The American mentality that the players have is a winning one," Harvey said. "Throughout their careers they've had to work hard for everything, whether that's at their club, their high school or their college. "That's a little bit different to home where we're too quick to give kids stuff rather than make them earn it, especially within the women's game. "There are so many kids playing football here and the pool of players is so big that if they don't train many times a week then they're not going to stand out. "The pool of players in the UK is much smaller so if you've got some talent, you don't necessarily have to work as hard to get to where you want to go." Wales international Jess Fishlock and Scotland duo Kim Little and Rachel Corsie have joined Harvey at Seattle, while England's Lianne Sanderson and Jodie Taylor also play in the NWSL. So does Harvey think more British players should follow them to America? "Without doubt Kim, Jess and Rachel have become better players since they've been here," she said. "Coming to the US is an opportunity to develop but I think the reality is that because of the central contracts, countries want to develop their own leagues which I totally agree with. "England players who are centrally contracted have a responsibility to help grow the WSL. "But I do believe that for the England team, it would help them if their players competed against players in this country. "It's a double-edged sword because if the big names from England came to the NWSL, then the WSL may take a big hit. "However, it might take their careers to another level which [could] mean England turn bronze into gold at the next World Cup." Seattle helped attract an NWSL record crowd of over 21,000 people when they travelled to Portland Thorns in July, while the highest crowd in the Women's Super League this season has been just over 2,000. "The big challenge for the WSL now, especially off the back of England's success at the World Cup, is that it needs to mean something to people," Harvey said. "The cost of going to games in the UK is so cheap. The clubs are never financially going to make money from that. "You have to make fans want to pay money to watch you play because you can't afford to give away free tickets. "That's the big challenge that we have at home. We've given away the opportunity to watch the games for free or little money for so long that now we've got to change the narrative." Having lost out to Kansas City in last year's NWSL final, Harvey says winning the title this year would mean "everything" as they seek revenge. "When I came over, we didn't even have a cone, we literally were nothing," she said. "There was the owner, the general manager and myself. We didn't have a single player, it was crazy. "To go from that in February 2013 to now is a phenomenal achievement and it would be the icing on the cake if we could win the final. "From the players' perspective, they owe Kansas because last year there was no doubt that we were the best team in the league. "We want to be able to walk away and say in 2015 we were the champions of the NWSL." "The men's game, with women playing"